Unchanged in twenty centuries? – For the fainthearted . 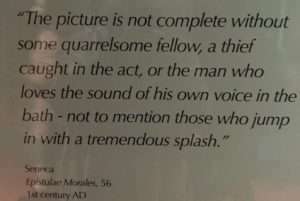 . .
“The picture is not complete without some quarrelsome fellow, a thief caught in the act, or the man who loves the sound of his own voice in the bath – not to mention those who jump in with s tremendous splash.” Words from the Moral Epistles of the First Century Roman philosopher Seneca are aptly displayed on a pillar at the Roman baths at Bath in Somerset. 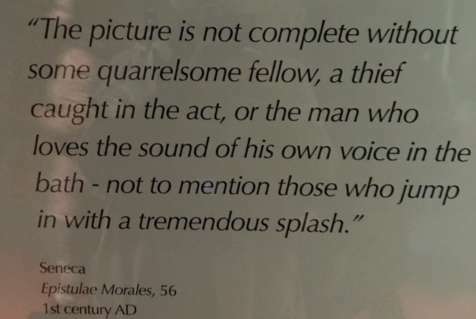 Thieves caught in the act seem not as common as twenty centuries ago, but there seems something unexpectedly familiar about the other characters Seneca encountered on his visits to the public baths. The advent of social media has created untold opportunities for those inclined to be quarrelsome. Online forums, Facebook pages and Twitter have allowed for the emergence of trolls whose only object is to provoke quarrels. 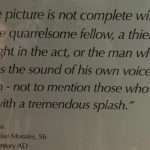 Seneca might be shocked at the extremes to which being quarrelsome has been carried. Conventions of politeness have disappeared in exchanges from anonymous keyboards, and truth has become optional for those intent on winning their quarrel (or imagining they have done so, for no-one ever wins an online spat, the person supposedly vanquished simply goes elsewhere to pursue their battle). If a person’s liking for the sound of their own voice was an annoyance to Seneca, he would find frequent cause for irritation in Twenty-First Century society. In times when people are famous for simply being famous, the chances of speaking aloud to millions of listeners have multiplied repeatedly. The tabloid media have been superseded by satellite television programmes, fan websites, YouTube videos – it is no longer just in the baths that the loud can make their voices heard. And what about those who jump in with a tremendous splash? What about those who, perhaps unwittingly, seem to have little regard for those around them? To complain at someone’s behaviour invites the question as to what right anyone had to tell someone else what to do? It brings the suggestion that their wish to jump in the pool, or whatever else it is that may discommode others, is as valid a way of behaving as the behaviour of those who behave quietly and peaceably. Perhaps Roman baths were a microcosm of the society in which they existed, or perhaps they were atypical of social life at the times, giving rise to Seneca’s complaint about the behaviour he encountered. Were one to attempt to identify a microcosm of behavior in the Twenty-First Century, it is difficult to imagine a parallel. Perhaps the advantage of the quarrelsome, the self-promoting, and the disruptive existing in a virtual world is one can simply switch it off. Is it that we are meeting more of that type or is just a question of numbers. Are we connect with more people generally and the percentage is more or less the same. A bit like Daily Mail readers. It can be quite shocking when you find out in passing someone takes it.